Aerial view of the Falayah Fort and the recent excavations carried out by Christian Velde for the National Museum of Ras Al-Khaimah (Photograph by Dr Mark Beech). 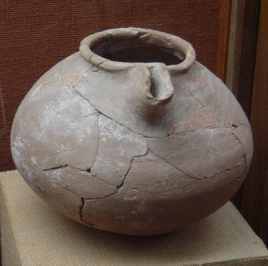 Spouted jar from Shimal tomb 103 - Wadi Suq period (2000-1600 BC), National Museum of Ras Al-Khaimah (Photograph by Dr Mark Beech). Kush - A Parthian, Sasanian and early-Islamic tell in the Emirate of Ras al-Khaimah, UAE. Monsoons, coffee and senna pods: uncovering past environments and civilisations in Arabia - Newsletter 4 (2003) by Dr Adrian Parker (Department of Geography, School of Social Sciences and Law, Oxford Brookes University). Attewell, M. 1987. Ras al Khaimah Museum, The Collections. Bulletin of the Emirates Natural History Group 32: 14-17. [ to download this article in Acrobat .pdf format click here (1.7 MB) ]. Goudie, A.S., Parker, A.G., Bull, P.A., White, K. and Al-Farraj, A. 2000. Desert loess in Ras Al Khaimah, United Arab Emirates. Journal of Arid Environments 46(2): 123-135. Hansman, J. 1979. 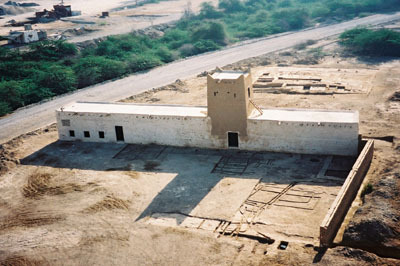 Archaeological Excavations of the Islamic Period in Ras al Khaimah. Bulletin of the Emirates Natural History Group 9: 2-5. Hansman, J. 1985. Julfar, an Arabian Port. Its Settlement and Far Eastern Ceramic Trade from the 14th to the 18th Centuries. Royal Asiatic Society, Prize Publication Fund. Vol XXII. Ishida, S., Parker, A.G., Kennet, D. Hodson, M.J. 2003. Phytolith analysis from the archaeological site of Kush, Ras al-Khaimah, United Arab Emirates. Quaternary Research 59: 310-321. Kennet, D. 1994. Jazirat al-Hulayla - early Julfar. Journal of the Royal Asiatic Society, Series 3, 4, 2: 163-212. Kennet, D. 1995. The Towers of Ras al-Khaimah. BAR International Series 601. Kennet, D. 1997. Evidence for 4th/5th-century Sasanian occupation at Khatt, Ras al-Khaimah. In C.S. Phillips, D.T. Potts and S. Searight (eds.) Arabia and her Neighbours. Essays on prehistorical and historical developments presented in honour of Beatrice de Cardi, pp. 105-116. Kennet, D. 1997. Kush: a Sasanian and Islamic-period archaeological tell in Ras al-Khaimah (U.A.E.). Arabian Archaeology and Epigraphy 8: 284-302 . Kennet, D. 2000. Kush, a Sasanian and Islamic occupation sequence from the Gulf. Universities of Durham and Newcastle-upon-Tyne Archaeological Reports 23: 103-108. Kennet, D. 2002. 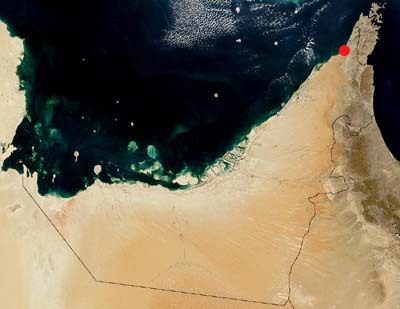 The development of Northern Ras al-Khaimah and the 14th-century Hormuzi economic boom in the lower Gulf. Proceedings of the Seminar for Arabian Studies, 32. 151-164. Kennet, D. 2003. Julfar and the urbanisation of southeast Arabia. Arabian Archaeology and Epigraphy 14: 103-125. Kennet, D. and Velde, C. 1995. Third and early second-millennium occupation at Nud Ziba, Khatt (U.A.E.). Arabian Archaeology and Epigraphy 6(2): 81-99. Sasaki, H. 1993. Excavation at Julfar, 1993. Proceedings of the Seminar for Arabian Studies 25: 107-116. Sasaki, T. 1993. Excavations at Julfar in 1992 season. Bulletin of Archaeology - The University of Kanazawa 20: 1-49. Sasaki, T. 1994. 1993 excavations at Julfar. Bulletin of Archaeology - The University of Kanazawa 21: 1-106. Sasaki, T. 1995. 1994 excavations at Jazirat al-Hulayla, Ras al-Khaimah. Bulletin of Archaeology - The University of Kanazawa 22: 1-74. Sasaki, T. 1996. Umayyad and Abbasid finds from the 1994 excavations at Jazirat al-Hulayla. Bulletin of Archaeology - The University of Kanazawa 23: 179-222. Sasaki, T. and H. Sasaki. 1992. Japanese excavations at Julfar: 1988, 1989, 1990 and 1991 seasons.Proceedings of the Seminar for Arabian Studies 22: 105-120. Sasaki, T. and H. Sasaki. 1996. 1995 excavations at Jazirat al-Hulayla, Ras al-Khaimah. Bulletin of Archaeology - The University of Kanazawa 23: 37-178. Sasaki, T. and H. Sasaki. 2003. Southeast Asian Ceramic Trade to the Arabian Gulf in the Islamic Period. In: D.T. Potts, H. Naboodah and P. Hellyer (eds. ), Proceedings of the First International Conference on the Archaeology of the United Arab Emirates (Abu Dhabi, 15-18 April 2001). Trident Press, London. pp. 253-262. Velde, C. 2003. Wadi Suq and Late Bronze Age in the Oman Peninsula. In: D.T. Potts, H. Naboodah and P. Hellyer (eds. ), Proceedings of the First International Conference on the Archaeology of the United Arab Emirates (Abu Dhabi, 15-18 April 2001). Trident Press, London. pp. 101-114. Vogt, B. 1994. Asimah : an account of a two months rescue excavation in the mountains of Ras al-Khaimah, United Arab Emirates. Shell Markets Middle East, Dubai. Vogt, B. and U. Franke-Vogt. 1987. Shimal 1985/1986 : excavations of the German Archaeological Mission in Ras Al-Khaimah, U.A.E. : a preliminary report. Berlin, D. Reimer. Western, R.A. 1984. As Safarfir - An Early Islamic Copper Mine in the UAE. Bulletin of the Emirates Natural History Group 24: 2-13. Worrell, S. and J. Price. 2003. The Glass from Kush, Ra's al-Khaimah, U.A.E. In: D.T. Potts, H. Naboodah and P. Hellyer (eds. ), Proceedings of the First International Conference on the Archaeology of the United Arab Emirates (Abu Dhabi, 15-18 April 2001). Trident Press, London. pp. 247-252.